Waterbury Clock Co. "Desk Set", C. 1929. 8 day jeweled movement of the non striking type, 2.5" silvered metal dials. The clock is wound and the hands are set by turning the pilot wheel, which also acts as a bezel for the clock Beveled glass over both dials, signed by the maker. Wood base, metal clock case and wheels. Clock is running, haven't tested the barometer. Overall excellent condition. Clock is 9.5" wide and 6.25" high. 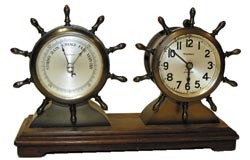 The same clock and barometer sets are pictured with different bases in Ly-Waterbury, page 534.